Sinclair then held Leiberman to contractual language that blocked him from seeking a job at any television stations in the 39 markets where it has operations. Out of work, and hampered from finding work elsewhere, Leiberman accordingly applied for unemployment benefits. And he got it — until Sinclair challenged his right to get them. The company’s challenge was successful, and Leiberman had to return the benefits he’d received. 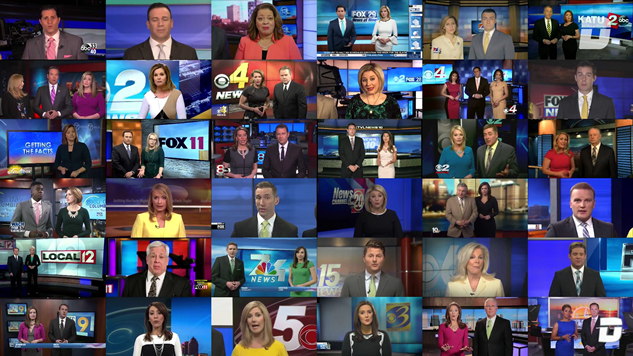 Which brings us to our present-day issues with Sinclair, who purchased 42 local TV news stations to give them a presence in 72% of the country. This video is chilling. These and the awkward monologues by Trump's failed army of nincompoops are both called “must-run” segments, and these stations have no choice in the matter, which is what makes FOX 47 Madison's rebuke of their corporate masters so powerful. If Sinclair can come down like a ton of bricks on a former Washington bureau chief, just imagine what they're able to do to a local anchor. A lot of people have derided the people at these stations as complicit in this shadow attack on the very concept of a free press, but they have next to no leverage. Leaking is all they can safely do, but that even carries heavy personal risks, as this leaked e-mail from Sinclair management demonstrates. Simply quitting isn't that easy, as a report about tensions escalating at KOMO News in Seattle highlights. We can confirm this threatening language in their contracts as journalists have leaked portions of their legal agreements to the Los Angeles Times' Matt Pearce. Former federal prosecutor Renato Mariotti said “this provision is very likely unenforceable.” Pearce posted other portions of the contracts to Twitter. Another lawyer, Ken White (known on Twitter as “Popehat”), raised issues with the portion of the employee's contract which forces them to cover Sinclair's legal fees, but not vice versa. In California, that clause would (1) be very useful to break the arbitration agreement, since it's unconscionable, and (2) would be treated as if it were mutual under state law. Bloomberg also received copies of employee contracts, and they confirmed the existence of this loaded legal gun pointed at every journalist's head. According to copies of two employment contracts reviewed by Bloomberg, some Sinclair employees were subject to a liquidated damages clause for leaving before the term of their agreement was up: one that requires they pay as much as 40 percent of their annual compensation to the company. Multiple employment lawyers said the damages clause wouldn't turn up in most employment contracts. “They are pretty rare—for ordinary workers at least,” said Peter Romer-Friedman, an attorney at Outten & Golden LLP, a labor law firm. But they are more common in the broadcast industry, specifically when dealing with on-air talent. The clause serves to protect companies from costs associated with replacing an anchor who suddenly leaves, for example. Yet at Sinclair, at least some employees who never appeared on television were still required to sign such contracts, the former employees said. Scott Livingston, vice president of news at Sinclair, sent a memo to employees defending the company, and of course it was forwarded on to Bloomberg because this company is leaking more than the Titanic right now. There is a lot of noise out there about our company right now, and what is lacking in that analysis is something we constantly preach; context and perspective. So spare me your outrage Sinclair executives: your jihad is completely transparent now. Honestly, it didn't even need to get this far to be this obvious. The biggest giveaway is that you made this milquetoast jar of Trump-approved warm mayonnaise one of the faces of your must-run segments. Forget ideology for a second and look at this from a pure television perspective, how the hell could you watch this wooden performance and think this man makes good TV? Sinclair Broadcast Group is just another front in the war being waged by geriatric white men upset at a world which rejects their warped version of morality. These broken human beings cannot reckon with a populace awash with tolerance and open-mindedness, and so they seek to impose sclerosis on our most vital industries. Whether it’s natural resources with the Kochs, or Israeli policy with Sheldon Adelson, or David Smith’s Sinclair Broadcast Group, we’re watching the same thing: a rotten ideology flailing about in its death throes as the march of time slowly erases its ill-gotten gains. Modern conservatism is a grift and Sinclair’s totalitarianism is proof. If combating “fake news” really was a journalistic priority necessitating specialized segments, they wouldn’t have to be ordered from down on high. So don’t be dismayed that Sinclair is injecting Trumpian propaganda into your local news, be inspired that journalists are fighting back. It may not be the open act of cathartic defiance that we all want, but they’re chipping away at Sinclair’s influence, little by little. The initial response from legal experts suggests that some of the financial penalties in these contracts are unenforceable, and given Sinclair’s aggressive transgressions, it seems inevitable that some brave journalist will walk this expensive path at some point. All it takes is one court case to set a precedent that would strike a blow to Sinclair’s power, injecting their newsrooms with a much-needed dose of independence. This isn’t a problem that is going to go away overnight, but if there’s one thing that we should learn from history, it’s that those in power who abuse it will inevitably face a comparable blowback.